Poll: Who do you want to win - Conservatives or Liberals? | May 2011 Canadian Election - Gateway to Canada | Canada Immigration Consultancy! 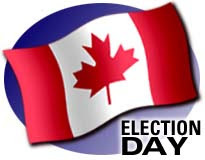 The 2011 Canadian federal election is scheduled on May 2, 2011. The next Prime Minister would probably be a choice between Stephen Harper (Conservative) and Michael Ignatieff (Liberal). Now, who's the real pro-immigration? The future of Canada's immigration program depends on who will be in power after the election. Back in 2008, when the proposed bill to modernize the immigration system was being debated, the Liberals were against it. It's the bill that gave the Immigration Minister the POWER to decide who will be prioritized under Federal Skilled Worker program. Is Canada closing the door to immigration? Liberals: All bark, no bite? The conservatives managed to pass the bill. Then few months after passing the bill, a Snap Election was held. The Liberal vowed to reverse the said measure if they win. Unfortunately, they did not make it. Harper remained in power and the immigration department has been under the control of conservatives since then. Thus, there's already a couple of Ministerial Instructions and another one is expected this coming June 30, 2011. And now comes the May 2011 Canadian Election. Who do you think should win to have a better immigration system? Do you think the current immigration regulation is fair? Though it seems immigration is not a hot issue for this election, the result of this election would definitely affect the immigration program. If you are to vote, who will you chose? The Liberals or the Conservatives?